With a couple more visits under my belt, the map of Austria was starting to get some red ink and as I’d decided at the outset to try to be fairly methodical about it, I set my sights on Upper Austria. Lucky as it turned out, with the closure (almost) of Kleinreifling-Selzthal being announced after I’d decided my itinerary (which included it) and timed for a few days after my visit. Car to LHR today, for BA’s Airbus at 14:40 to Wien. Left a few minutes late due to waiting connection from an incoming flight from the US (ours being a codeshare with American Airlines). Schedule padding rules OK though, and G-EUUU got us to VIE on time at 18:10. Thence by the 18:41 S-Bahn to Wien Praterstern and the perfectly acceptable Hotel Kunsthof (HRS no-cancel rate €70, rack rate €171!). Total failure at Brigittabräu again, where we were refused service at 20:50 (trams 5 and 31 to get there, though I won’t be bothering with this unfriendly establishment again). Back by U- and S-bahnen via Handelskai to Praterstern where Gösser and schnitzels were taken in the Café de Paris, a.k.a. the station buff. Very hot and sticky back at the hotel but we were tired enough to crash out anyway. Decent breakfast from Hotel K, and off to Praterstern on foot (tram at stop, lights red, can’t cross, lights green, tram goes...) for ticket, timetable, water and (for emergency of course) beer purchase before the slightly delayed 08:46 Weasel to Payerbach-Reichenau. Haulage on this was James Bond’s 1116-007. Announcement before Mitte, something to do with Wiener-Neustadt, hopefully non-sinister! Diveunder taken west of Meidling – significance to be determined. We stopped in the middle of it. At Payerbach-Reichenau we used the up side island, P2/3 instead of the booked P1. Geographical overlap therefore, with a cross platform change to the 6020 for Mürzzuschlag. Once past Wiener-Neustadt it’s all very scenic. 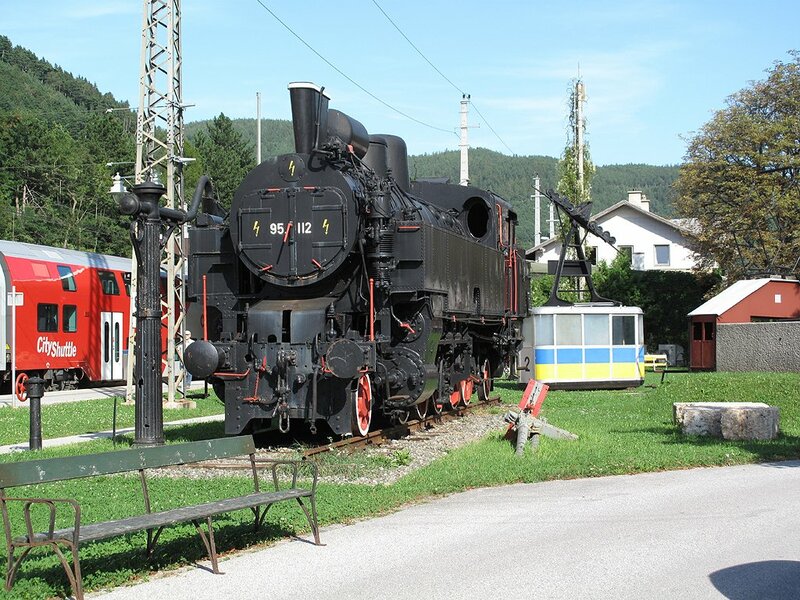 There seems to be local pride in the line with one of the bankers (I assume – it’s a 2-10-2T) plinthed at Payerbach-Reichenau, a memorial presumably to the engineer at Semmering, a preserved class 33 4-8-0 at Mürzzuschlag, pictures in the pub at Mürzzuschlag (beer was Murauer, very pleasant) and so forth. On to Stainach-Irdning in 4024 043, very hard seats for a 2½ hour journey. The reversal at Selzthal caught me out as I hadn’t studied the geography [tut, tut]. We reversed in 2a at the north end of the station which was fairly gentlemanly although the north east end might have been better! Delayed en route to Stainach-Irdning awaiting an oncoming Saarbrücken-Graz EC – DB stock with a 101 or similar at the rear. Thus delayed we arrived with about 45 minutes to wait for our REX to Attnang-Puchheim. A great Euromoment ensued as we tottered out of the subway on to P1 and found an open station buffet (temperature’s around 31 and humidity feels like 120% so walking wouldn’t be any fun even if we could find a pub). Two Gössers in the shade of P1’s verandah made for a very pleasant break – not only that but the REX turns into [in fact is attached to] IC647 at Attnang-Puchheim and was formed of 1044 055 and three nice air-con IC coaches (and a DB Nachtzug second, but why bother). The nice air con IC coaches became very full as we progressed to Attnang-Puchheim. It’s a very scenic line with its full complement of mountain/forest/lake and well worth the couple of hours. Into A-P about 4 late but in good time for the connection to Linz which had to wait for the IC to go anyway (the coaches from Stainach-Irdning were gronked on to the rear of a Salzburg – Wien IC, by what I know not). Useful for me to be on a stopper over this section as it had to do the old line through Lambach. I’d noticed in the timetable a man-of-steel +2 on to EZ5921 at 19:02 to St. Valentin – sure enough it was still there waiting for a green light and we were able to dive in. Nice preserved coaches and stopped only at Enns so all in all it was much superior to the 19:53 stopper. Haulage was 1044 006. Cordial welcome at the Kerschbaumer Gartenhotel followed by a walk into St. Valentin’s town centre. ‘Head for the church’ worked, as usual, and was rewarded by an exceptionally nice pork steak and veg accompanied by a couple of Kaisers. 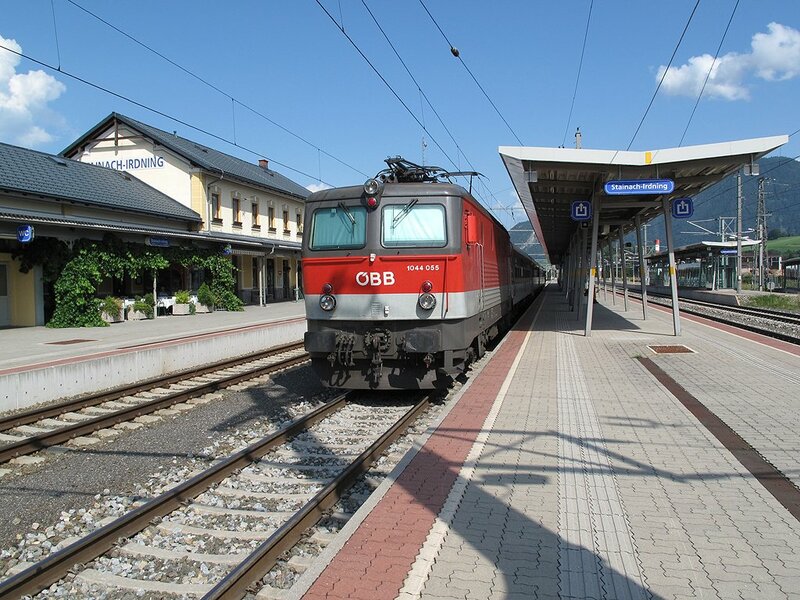 1044 055 at Stainach-Irdning. The beer department's among the greenery to the left. Slightly parsimonious breakfast, as on previous visit, but it set us up well enough for the 4024 on R3648 at 09:43 to Linz. Forward from there on a ‘City Express’ set shoved by a venerable looking 1142 623 (more to do with the state of the paint than the age of the loco). Grünau im Almtal was the morning’s ‘feature line’ though a bit short of features. Quite a long trudge there and back on 5047 097, just over an hour each way with a 7 minute break. Refreshment break at Wels, including Gösser Märzen which seems to can exceptionally well! The afternoon put right a previous failure [on 27.8.08] with a 4024 to Neumarkt-Kallham, 5047 074 to Braunau am Inn for a 50 minute fester, there being no pub nearby, and 5047 061 down to Steindof bei Straßwalchen. The connection there was 4 minutes and we were 4 late at one point due to waiting for an oncoming freight at one of the loops. All was well though and we made the 4024 which was working the Linz REX. 19 minutes at Attnang-Puchheim offered a pivortunity. What we should have done is pop into the buffet. What I did do was to chase off outside to search for cans. Mistake. On to Linz still thirsty, arriving in time to see the 19:02 EZ go. Didn’t matter as we were heading for supper which was taken at the Klosterhof (Stieglbräu). Excellent beer garden which appears to be the centre part of a cloister. The pub name and the proximity to the cathedral would suggest that it is! Just made it back to Linz Hbf for the 20:53 stopper to St. Valentin, a much needed shower and an early night. Birthday cards exchanged [don’t ask], breakfast at 07:00 sharp and away on the 07:43 to Linz Hbf. Shopping first to avoid risk of beer deprivation, then to Urfahr on the tram, and a coffee before 09:30 to Aigen-Schlägl, worked by 5022 018. It’s a long steady plod to Aigen-Schlägl, quite pleasant in the upper reaches although the weather’s poor this morning so it didn’t look as good as it might. The village (presumably Aigen as Schlägl is the previous stop) is perched on a hill beyond the terminus – a tunnel would have been needed to go any further. 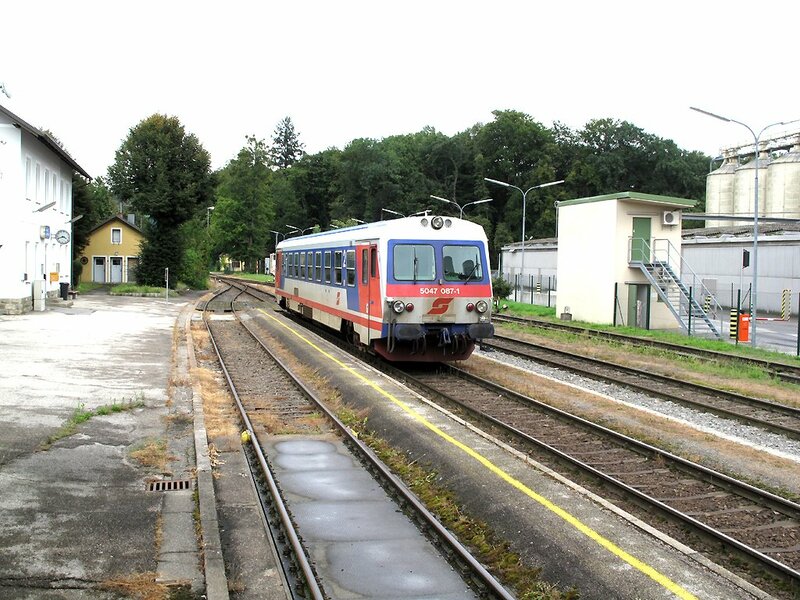 The rain relented enough for a few phots at Aigen-Schlägl, and the conductor kindly agreed to my leaping off at Rohrbach-Berg on the return, to phot [unsuccessfully, through no fault of the conductor’s] the plinthed 0-4-0T. Back from Urfahr on the tram then a lunch break at Linz Hbf before the 4024 to Wels on a Salzburg stopper. Great relief at Wels to find 14:57 Aschach a.d. Donau on the screens as the line had been closed for moleworks until yesterday! A little hiatus with an ICE on the scheduled P5 but they got it away after a fag break for the pax, and 5047 087 turned up in good time. H and I travelled in solitary state to Aschach – on arrival the driver was found to speak good English, just like any LM (etc.) driver would speak good German/French/whatever. A short walk into Hartkirchen rewarded us with a splendidly ornate church, with high pointed roof but only slightly concave ceiling beneath. [We had been wondering about the numerous steeply pitched roofs to be seen on Austrian churches, and whether the nave inside would be open to the roof.] Across the road was – surprise, surprise, head for the church worked again – a very pleasant pub dispensing the reasonably forgettable but inoffensive Stiegl ‘ordinary’. Back to Wels on 087, for the end of a day well done! I’d had fears for both branches, but Aschach in particular. A 40 minute fester at Wels ensued, but 1142 632 turned up slightly early with our Passau-Linz REX to alleviate the boredom. At Linz, no. 2 tram to Mozartkreuz for the Josef homebrew, a rather pretentious establishment with a very cloudy yellow Hell and a Dunkel which I didn’t have. Unimpressed with both pub and beer, food OK but I wouldn’t bother again. We retired to Klosterhof for a Stiegl weizen (beer garden closed, but a nice beer hall of the traditional kind) before the tram back to Hbf. where we made the 20:53 stopper by a very narrow margin. Away at 8 after paying the bill twice when Ms NotTheSharpestKnife didn’t put the voucher in correctly (the original was torn up in front of us so all OK). 08:20 to Kleinreifling was on time, City Express stock with 1116 092 hauling. A lovely morning and cooler too, with mist just clearing so an enjoyable run once out of the flatlands. Very quick change at Kleinreifling into more City Express stock, 5 coaches with another 1116. The line to Selzthal, closing next Sunday night (allegedly) is spectacular. Mountains over 2000m., narrow river gorge, avalanche shelters – the real deal. It’ll be a real loss if it goes. Train was half to ¾ full but a morning train on a fine summer Sunday probably isn’t representative. 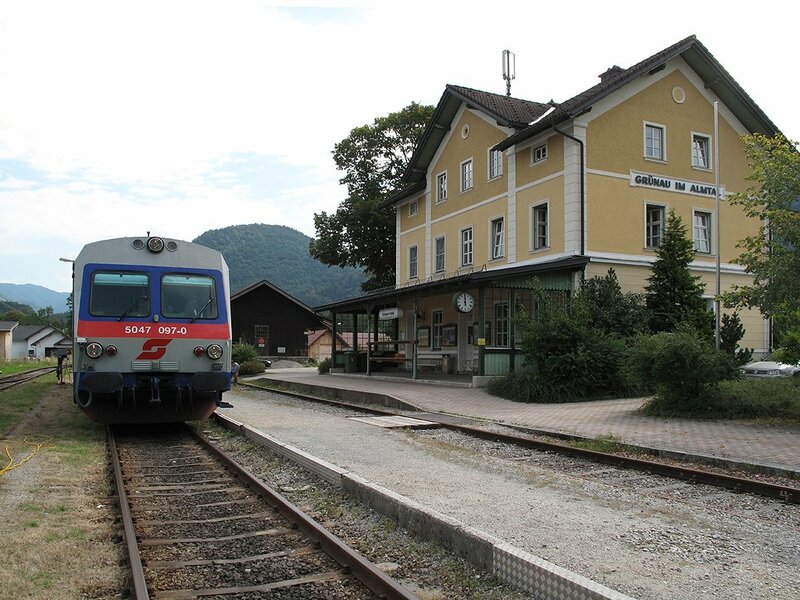 I could only see 1 passenger on a Selzthal-Kleinreifling which we crossed en route and at Selzthal most pax seemed to pile on to a waiting Graz-Bregenz EC. Top quality foraging by H who located (with permission) the staff coffee machine which provided coffee for 35 cents vs €1.50 for Coca-Cola, water etc. from the public machine! On to Mürzzuschlag on a 4024 with the same gripper, presumably a Selzthal man. Bruck an der Mur obliged with a 20 minute scheduled stop during which Stiegl supplies were obtained. Mürzzuschlag is seriously, seriously shut on Sundays but after some searching we found a pizzeria to do us lunch accompanied by warm, sweetish Puntigamer and a lot of wasps. It filled the gap though (as well as keeping us up to date with the Belgian Grand Prix) before we pottered back to the station to join the 4020 at 15:35 to Payerbach-Reichenau. Everything progressed smoothly through the change at Payerbach (to a ‘Weasel’ Dosto set), and at Wiener-Neustadt until the 4020 for Stockerau via Ebersfurth was replatformed. We managed to spot that, however, and suffered the incredibly tedious journey through the flatlands. Just before Meidling came the announcement that ‘Diese zug endet hier’ and so it did, with no word of explanation. We baled out with everybody else and within a few minutes were on an R to Bernardsthal which being a bit quicker, got us to Praterstern only a few minutes behind time. Back to the Kunsthof for our final night, with a fuel stop at Praterstern and a lager at the 1516 Brewing Co., much the best beer of the trip even if ludicrously expensive. 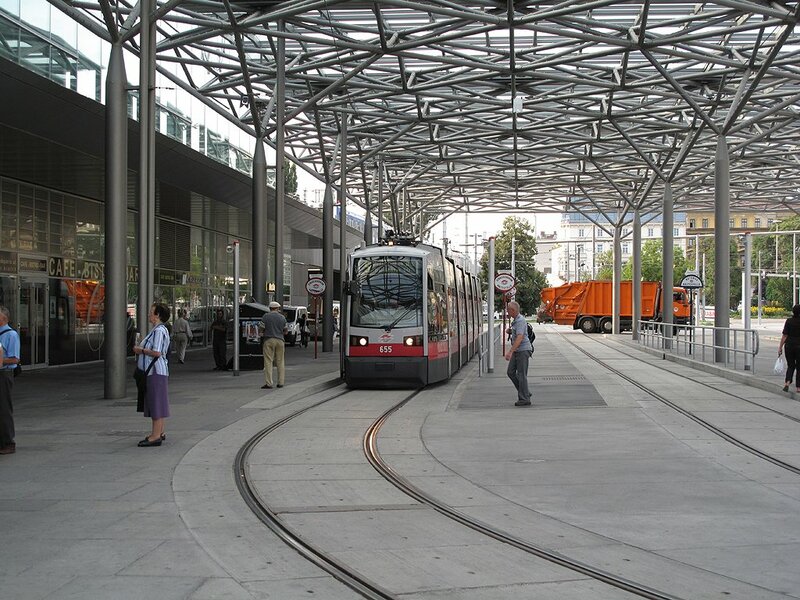 Bright and cool(ish) again, nice breakfast at Kunsthof again, and off by tram – how lazy can you get – to Praterstern. 08:08 S-Bahn (a 4020) to Handelskai where it only takes a couple of minutes to get downstairs so we got 08:18 (a 4020 again) to Hüttelsdorf instead of the planned 08:28. Just gave us an extra 10 minutes fester at the unprepossessing Hüttelsdorf. Failed to phot the MAV 1047 on a RoLa due to leaving the camera on long exposure from last night, but did get the 1116 on the 09:09 arrival from Salzburg. On to Meidling in another 4020 to do the west-south side of the Hütteldorf-Speising-Penzing triangle. South to east side noted in passing, it’s single line like the west to south. A few minutes to kill at Meidling where the ER to Südbahnhof main line was craftily replatformed from 2 to 5 but again failed to catch us out. It was a few minutes late at Südbf., and we missed the tram so got an S-Bahn to Mitte and U3 from there to Westbahnhof. 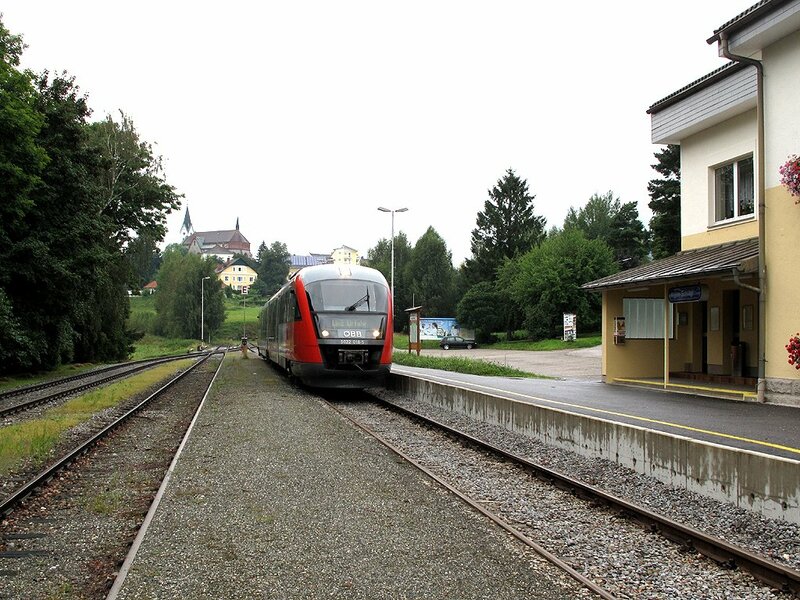 Final track of the trip was the east to south (Penzing-Speising) curve then it’s ‘just’ a matter – never count chickens – of round to Rennweg and out to the airport. 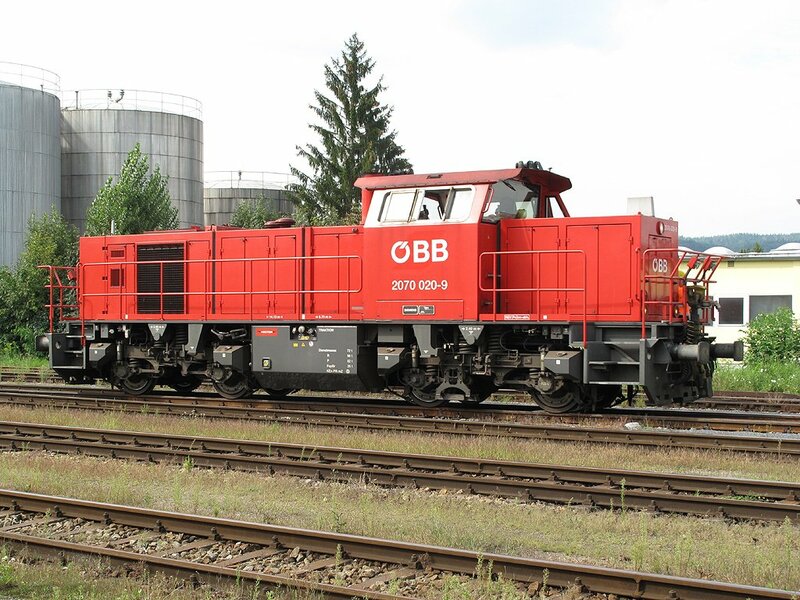 Train used from Westbf – Krems a.d.D. Why they run this circuitous and occasional service, I know not. Just shows I was right about the chickens. No problem getting to Rennweg but on arrival there, the airport service disappeared from the display in favour of the two following ones (Meidling and Payerbach-Reichenau, or possibly v.v.). The airport service did appear in the end though and as we’d left a reasonable margin it was all plain sailing after that with a punctual BA flight, my first on a Boeing 757, the long immigration queue at T3 (totally avoided by the wondrous IRIS), a prompt pickup by the cheerful Purple Parking man and a drive home with only 5 minutes or so delay by a coming together of vehicles at the Cherwell Valley junction on the M40. So ended a very hot and sticky trip, at least for the first couple of days, but as far as track was concerned a totally successful one apart from Tulln to Herzogenburg and Linz to Selzthal, both knocked out by moleworks. I’d spotted this beforehand however so we were able to avoid any bustitutions.